Mohair production by Angora goats can be affected by plane of nutrition, including dietary S concentration. The high concentration of cysteine in keratain relative to that in plant material suggests that wool- and mohair-producing ruminants could require greater quantities of S-containing amino acids than other ruminant classes. Most protein and S-containing amino acids available for digestion and absorption by ruminants are derived from dietary protein escaping ruminal fermentation and microbial protein synthesized in the rumen. Microbial protein formed in the rumen depends on the quantity of OM fermented and availability of required nutrients such as ammonia. Besides effects on the quantity of microbial protein synthesized, nutrient availability can impact composition of microbial cells, and it has been proposed that the level of amino acids containing S (methionine, cystine and cysteine) in ruminal microbes might be reduced by a deficiency of S. Therefore, the objective of this experiment was to determine the effect of dietary S on amino acid concentrations in ruminal fluid bacterial cells of goats. 12 Angora (18 ± 0.6 kg BW) and 20 Alpine (24 ± 1.0 kg BW) goat wethers consumed diets (14.3% CP and 1.67-1.80 Mcal/kg ME, DM basis) with 0.11, 0.20, 0.28 or 0.38% S (supplemental S: CaSO4; N:S ratio: 21, 12, 8 and 6, respectively) for 10 weeks to determine effects of dietary S on amino acid concentrations in ruminal fluid bacteria. 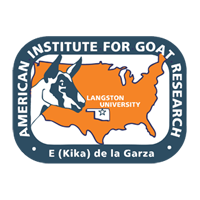 In this experiment, dietary S as influenced by level of an inorganic source did not appreciably alter amino acid concentrations in bacteria from ruminal fluid of goats harvested immediately before and at 4 h after feeding a diet moderate to low in digestibility. Thus, there was no evidence to suggest effect of dietary S on S-containing amino acids available for animal metabolism, apart from possible impact on the quantity of synthesized microbial protein.